Once upon a time there was a special place. So special, that the people of the land and country on both sides of the place were not allowed to go there, unless invited or to work. The only people who could live there were aliens from another land. And they brought that other land with them, right down to mowed lawns, schools and supermarkets, bowling alleys and cinemas. But only the aliens were allowed to send their sons and daughters to the schools, and only the aliens were allowed to shop in the stores. This special place, we'll call it "The Zone" contained the single most valuable national infrastructure asset in the country. An asset so huge and costly to build, that it became one of the single most important strategic assets of the aliens, and of the world; more important than almost any infrastructure asset in the aliens own land. Now imagine that this asset could generate, directly, or enable up to 20% of the country's GDP, if it could be exploited by the country it sat in. Imagine also that this asset could, but did not, generate a continual revenue stream to the national government, that could be used for development, roads, education, rural electrification, ports, healthcare systems, the list goes on. Oil is one of the only natural resources that is able to generate that kind of benefit for a country, but then only if the global oil market is delivering a price point that exceeds the extraction and committed costs associated with that oil. But as oil is fungible and (relatively) plentiful, too often countries have created spending commitments based on a oil prices at their peak, and not at their trough or even average price. The price of oil jumps, then crashes, then crashes and jumps again, and now is relatively stable at a level below the cost of production for many countries that rely on oil revenues. Imagine instead a resource that is limited, stable, non-fungible, with a clearly definable economic break even point for consumers and users of that resource. And where was that special resource? In "The Zone" of course, out of reach of the country in which it sits, and completely under the control of the aliens with their supermarkets and schools and mowed lawns. To make matters worse, the aliens were giving it away! Access to the resource was mandated to be provided at an operating break even price, not at a economic break even price for the user of the resource. This means that the users effectively gained a massive windfall at the expense of the country. Restricted access to that infrastructure and asset, and the inability to influence the pricing of the asset (or use of the asset) and inability to access a revenue stream for the government, was holding back economic development of the rest of the country. So economic development outside "The Zone" progressed at a crawl, with the host country unable to enter "The Zone" without permission, unable to set the price of the resource, and unable to economically benefit from that resource. The Panama Canal is that resource, and it sits in the middle of "The Zone", a strip of land 10 miles wide, which since the end of 1999 is once again Panamanian national territory. Before the handover, the Panama Canal was mandated to run as a break-even proposition, owned by the United States government. As much at $10 million per year in profit could be provided to the Panamanian government, if the Canal ran a surplus. $10 million on annual revenues of $350 million is not a very good return on the asset, and this was the maximum that was authorized to be paid. In 1989, the Panama Canal Authority had revenues of US$329 million. With inflation, that $329 million in 1989 would equate to $638 million in 2017 dollars. 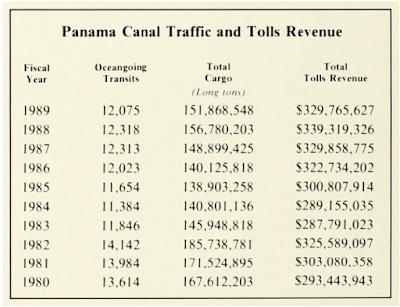 Current, 2016, Panama Canal revenue was $1,933 million, based on traffic volumes; total tonnage has almost doubled, while total transits remains comparable to 1989. So for decades, the equivalent of $1.3 billion in national revenue was effectively being distributed to shipping companies in the form of subsidized low-cost canal transits. "Including the passage of neopanamax ships by the new locks, the Canal recorded between October 2015 and September 30th, a total of 13,114 transits and 330.7 million CP-UMS tons (volume measurement of the Universal Systems Tonnage of the Canal of Panama), said the official information." Today "The Zone" remains, but is now Panamanian national territory, and while most of the land was converted into, and remains a national park, development does encroach. Most importantly though, the Canal now runs as a profit making infrastructure, delivering over $1.5 Billion into the Panamanian treasury every year. In addition to the direct revenue to the Panamanian government, the very existence of the Canal creates and enables a massive logistics and transport industry, accounting for over 20% of the GDP of the country. That increase in national revenue is remarkably stable. While traffic volumes fluctuate, the swings are in no way as wide, up or down, as the price of oil. Nor is the price of transit fungible. There is only one Canal, and the options are quite limited if you want to avoid rounding the South American continent, or if transporting across the North American continent by train is too expensive and time consuming. Therefore the Canal is able to price its service based on the economics of transporting goods by any other method or route. This creates a very steady revenue stream, and the country has been able to put that to good use for national infrastructure development. There is a long way to go for Panama, and as with all developing countries, the challenges are huge, not least education, health, infrastructure and employment (although official employment figures are health with an official unemployment rate in the 4% - 5% range for a number of years). Corruption is rampant, and while Panama is a major offshore financial center, the "Panama Papers" scandal of 2016 dented its reputation. If anything positive can be said about the 85 years during which the Canal was under US control, it is that the administrative and operational systems were put in place and a level of discipline inculcated that has carried over to Panamanian administration. The Canal is efficient, profitable, and well maintained, and functions as smoothly under Panamanian control as it did under American. "The Zone" remains, but is now an artefact. But also remaining is the question of just how developed could this country be if it had access to price and profit from the Canal for the 100 years that it has been in operation, and not for the 17 years that it has been under the control of the country in which it is located.